He, J.C. as we all called him, because there are so many Jim's in the family, was a high school stand out athlete. He was the star running back for Southwestern High School #28 and was an inspiration to many of his classmates. J.C. was a Boyscout in grade school, started wrestling in first grade and by the time he was ten took second in the New York State Kids' Wrestling Championships. He started playing midget football at ten and every year until he graduated and ran track and field in high school. He served several months training with the Egyptians, nine months in Bosnia when he was with the 3rd I.D. 98-01. Then he re-enlisted with the 1st I.D. at Vilseck, Germany and spent one year in Kosovo. Then he returned back to Germany and he trained six months with the Special Forces on urban warfare after which he deployed to Iraq where he always led the way. When he and his Scouts would do raids he would always go in first; per his Scouts of 2-2, and his acts of heroism were unmatched. On Nov. 10, when clearing Falluja, Iraq three Scouts were wounded and pinned down in a building, he stormed the building through smoke lying on the floor of the building with his wounded and bloody, he laid down fire saving the Scouts. Then on the 12th of November the D.O.D. gave me the awful news, they said: "our grateful Nation wishes to inform you Sgt. James C. Matteson while fighting gallantly from his position in the turret of his Hum-V received a direct hit from enemy insurgents' R.P.G. 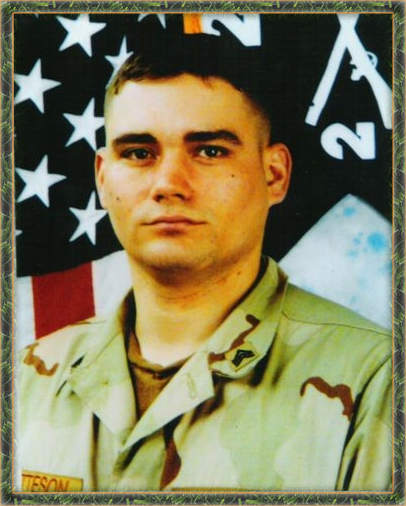 and was killed in action for the battle of Fallujah, Iraq 7:12 a.m. Falluja, Iraq time this November 12, 2004." J.C. had two sisters Hope Freedom Matteson (who served in Iraq Mar. 19 until Dec. 9-03) when she was medevaced out with a broken foot and was on crutches for six months, she is currently serving with 4th .I.D. Ft Hood, Texas); and, a little sister he adored Micaela Rose Matteson, six years old. Hope and J.C. were very close all throughout their childhood as well as adulthood. Hope joined the Army to go to Germany, in part to be close to J.C. When they were children everyone thought they were twins. They were only 12 months apart, almost exactly to the day; Hope was born on November 21 and J.C. was born on November 22. They were both born on Thanksgiving. I've given thanks for them ever since. J.C. also had two step brothers Nicholas Richard Knepshield and Brandon Russel Knepshield whom he was with since Nick was three and Brandon was born. To him, they were more then step brothers they were his little brothers he was very fond of. SSgt James C. Matteson, 23, of Celoron, New York died in Fallujah, Iraq when a rocket-propelled grenade struck his Hum-V. He was assigned to 2nd Battalion, 2nd Infantry Regiment, 1st Infantry Division, Vilseck, Germany. Died on November 12, 2004. A memorial stone was erected in Jamestown, NY in honor of SSgt. Matteson and his comrades, which has since been relocated to Five Corners in Busti New York.